Last night, we screened an hour of our documentary to a full house of friends, family, and fans. I understand there were 70 confirmed guests but just before the movie began people were still showing up and they kept adding seats so I think it's safe to say it was more like 80. 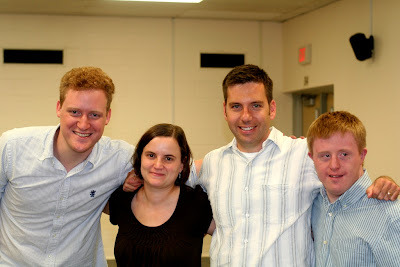 The event was held at Pattan in King of Prussia and was hosted by the Montgomery Country Down Syndrome Interest Group, run by Chris and Rose Townsend. Wee had a blast! Dan was brilliant all night long. He warmly greeted every guest like a true aristocrat, giving extra attention to babies with Down syndrome. He made a bit of a game out of it, trying to guess which children had it and which didn't. We sat behind the audience so we got a full sense of how they were reacting. It was a genuine thrill to hear them laugh at his jokes, cry when he's sad, even laugh and cry simultaneously during some scenes. 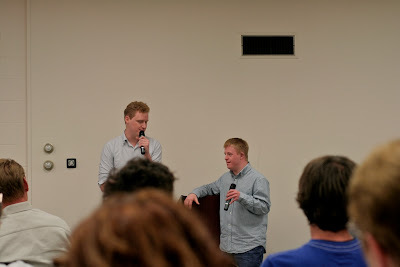 The Q & A seemed like it might go south when I asked who wanted to ask the first question and was met with dead silence but once we got going it went on a lot longer than we'd planned. After that, people hung around even longer to meet Dan and share their own stories. It was truly a great night. Hopefully the first of many. Thanks again to the Townsends for the wonderful opportunity. It was an honor. Dan works at a pretty cool super market. Acme threw a "Circus Of Stars" themed carnival during open store hours. They dressed up, gave out hot dogs and cookies to customers, and even hired a DJ, who setup right in front of the checkout aisles. Dan's role in all the fun is rather self explanatory.